The Miami Seaquarium is a 38-acre (15-hectare) ‘oceanarium’ conveniently located near downtown Miami. The park offers a variety of fascinating, interactive exhibits. 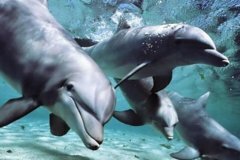 Immerse yourself in the fascinating underwater world with admission to the Miami Seaquarium. Explore the diverse seascapes of the world and experience the incredible natural wonders that lie beneath the waves. With more than 10 interactive exhibits, a visit to the Miami Seaquarium is perfect for the whole family! There are turtles galore to see: sea turtles, green sea turtles, and Kemp’s ridley sea turtles, plus loggerhead turtles, leatherback turtles, and hawksbill turtles. Then check out the popular Pacific and bottlenose dolphins and killer whales, often referred to as orcas. Plus the pinnipeds — that is seals, sea lions and walruses — and the harbor seals and California sea lions. And, of course, there are Florida manatees.